You know we have a little saying in Massachusetts. Maybe someday you'll get horribly sick and die. Until then I wish you continued health and happiness in the future. Jerry, you know I have a tremendous affection for my own intelligence, and even I think you are smarter than me. No, I'm much funnier when I'm kidding. you're about to experience one firsthand.See you in court. You know what they say, You never forget your first time. 不过偶记得就完全不一样了。。。有一次Danny Crane把手放在Shirley Schmidt的PP上，Shirley很有风度的说，in the meantime, Danny, could you please reposition your hand? Alan Shore也曾經出現在《律師本色》第八季，我最喜歡他最後對他蠻有感覺的一個女生(Tara)說，"I don't like being alone. I'm good at it, but I don't like it." 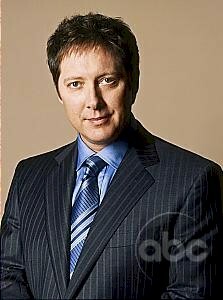 Alan Shore: Hey. Hey. I promise you, by the time I finish tomorrow; those judges, every last one of them, will rise up and say, "Never mind executing Ezekial Borns, let's kill Alan Shore instead."